Greetings, fans of two-pictures-that-are-seemingly-identical-but-are-actually-slightly-different-to-one-another! Aahh! 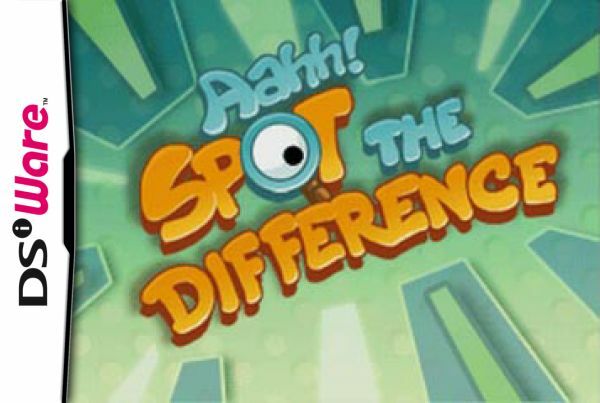 Spot the Difference is here to make you happy people indeed — as long as you don't mind the fact that it's short, bland and totally forgettable, that is. Adding another log to the bonfire of similar titles, Aahh! Spot the Difference doesn't really earn an identity for itself. It seems fairly promising the first time it's booted up, thanks to the animated twist to its puzzles, its cartoony visuals and its four modes of play, but it won't take you long to realize that there's more redundancy in this package than there is content. 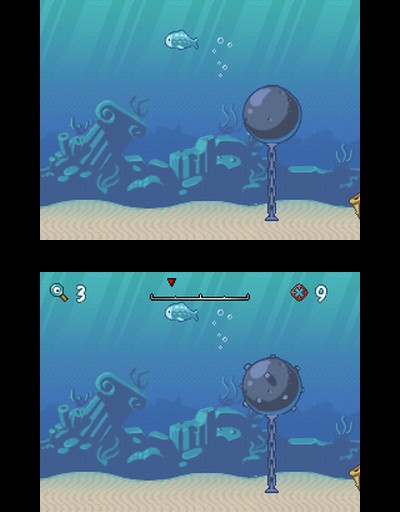 Players are asked to identify differences between the animations on the top screen and their very similar counterparts on the bottom screen. 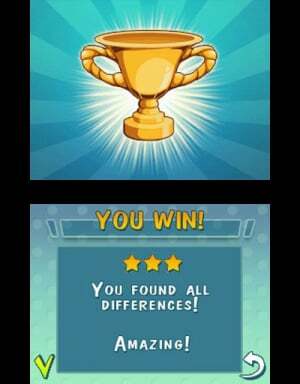 Tapping the different objects removes them from play, and you continue to do this until you either spot all the differences or run out of time. So far, so good. Unlike iSpot Japan, Aahh! 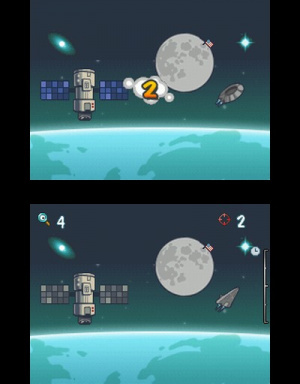 Spot the Difference doesn't resort to having you tap the empty space where an object is missing. In fact, every object is present on both screens, and the differences are colours, facial expressions or some other such details. You'd think that this would make it easier to avoid the unfair misses that plagued iSpot Japan, but as the objects in Aahh! Spot the Difference are moving, sometimes quite fast, it just racks up those unfair misses in a different way. The animations are more like Colorforms being dragged across the screen than anything worthy of real mention, but they do help the puzzles to feel slightly more dynamic. Unfortunately the drawing style feels particularly uninspired and free of surprises, making the entire experience feel like something of an amateur production. The bouncy but low quality and aimless music only serves to reinforce that feeling. With four modes of play you might think that Aahh! Spot the Difference contains a good deal of content, but you'd be wrong. 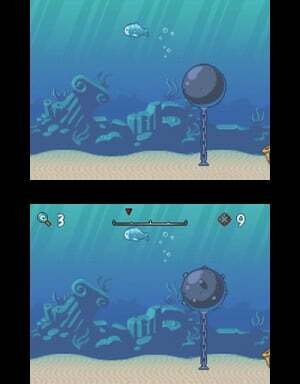 The main mode, Classic, is a gradual trot through the game's measly 40 puzzles. Spot the differences 40 times, and you can safely delete the game from your system, knowing you've exhausted all possibilities for enjoyment in the course of a single evening. The other three modes don't offer much more. In fact, it's practically a spot the difference puzzle to distinguish between them. Both Speed Attack and Time Attack have you solving puzzles under an imposed time limit, which isn't a particularly unique experience considering that Classic mode also has you solving these puzzles against the clock. Survival mode spices things up a bit by offering an 'endless' experience which continues as long as you keep finding differences. That's about it, though. The puzzles are typically quite barren, making differences easy to spot, and yet the animation often slides objects away faster than you can tap them, making the puzzles artificially difficult. With only 40 puzzles and four far-too-similar modes, it's pretty easy to lose interest in this one quickly. iSpot Japan wasn't particularly great, but its multiplayer mode certainly made it more exciting. Aahh! Spot the Difference, on the other hand, offers no compelling reason to return. Aahh! Spot the Difference is by no means a terrible experience, but it is forgettable in practically every way. The simple concept of spotting differences is presented in perhaps the most bland way imaginable, and the four different modes of play don't feel different enough from each other to warrant a particular recommendation on their behalf. The paltry number of puzzles also doesn't do it any favours, meaning that even those who do enjoy this game will find its content exhausted far too quickly. Awful, awful title for this game. Just... Terrible. You had me at the tag line, but then you had to go and mention Colorforms. 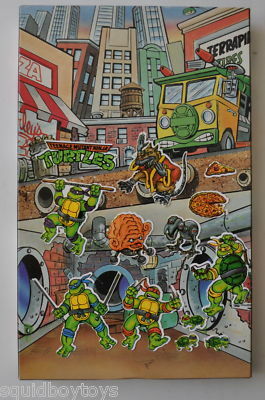 Man... now I'll have to take a trip over to ebay and relive my childhood. Nice review CB! I was expecting a 3 or 4 though, definitely not a 5!